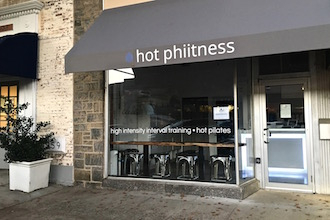 Nov. 14, 2018: The Bronxville fitness scene just got hotter with the recent opening of hot phiitness on Pondfield Road. The new workout facility, in the location previously occupied by Ricky Restiano Photography, offers its own brand of group fitness classes, incorporating muscle toning and cardio exercise with an amalgamation of methods. The hot phiitness method combines Pilates principles with high-intensity interval training and low-impact exercises. The room is set at 98 degrees to promote sweating, and movements are timed to the beat of the music. Modifications are offered to tailor the instruction to each participant, allowing people of all fitness levels to participate. Instructors work with students to correct their form, ensuring that muscles are working efficiently and that injury is avoided. “It’s like having private instruction in a group setting,” said Frannie Boyd Rochat, a former Wall Street executive who launched a second career in yoga instruction before opening hot phiitness. She and her co-owner, Richard Pike, each own Bikram Yoga studios elsewhere in Westchester; but having grown up in Bronxville, Rochat knew this was the right community for her new venture. The space features a reception area with lockers, a curtained coat closet, and a jar of courtesy hair ties. Check-in is done electronically on iPads. Window seating allows for pre- or post-class respite. Beyond the reception area is the studio, with a bathroom and a separate changing room in the back. Contributions from family and friends add charm to the hot phiitness vibe. Rochat’s sister-in-law, Carol Boyd, helps run and market the business, while Rochat’s husband was responsible for creating the etched-glass doorways in the back. The lighting and sound systems were created by a Broadway professional, while the wooden table in the front window was carved by a friend. Classes run 60 minutes, and registration is limited to 22 to 25 participants. Mats and towels are available for rental if needed (first-time rental is complimentary). Preregistration is encouraged to secure a spot and to streamline the check-in process. Credit cards are the only accepted form of payment. Rochat noted that hot phiitness is undergoing a “soft opening,” with a limited number of classes on the current schedule and more planned for the future. Also in the works is an app that will allow class registration from a smartphone. Single classes are $30; discounts are available through various package rates and for students. First-timers can take advantage of a three-class pack for $65, which is valid for use within two months. Ballet Muscle offer professional ballet lessons and ballet classes for children (including a class for boys) and adults. Owner Peter Cirolia danced alongside the famed New York City Ballet in productions choreographed by the immortal George Balanchine and studied under world renowned dancers like Mikhail Barishnakov, Peter Boal, Jack Soto and Elliot Feld. This experience and training provides Peter with an incredible ability to teach dance skills and bring the joy of dancing to all his students. Established in 1977, Ballet Arts-The Performing Arts Center of Southern Westchester offers a complete program of Performing Arts education for all ages. 28 teachers conduct over 60 classes per week including Ballet with piano accompaniment, Jazz, Ballroom, Tap, Irish Step, Lyrical Dance and Hip-Hop. New Classes: Creative Movement and Story Time Dance for 2 and 3 year old boys and girls taught by Selena Colburn, "Selena Ballerina". Fitness classes include Zumba, Pilates & personal training. Classes are available for students ages 2 to Adult in every skill level. Private Dance, Voice & Instrument Lessons at our studio or in your home are available by appointment. Seasonal and Summer Performing Arts Camps. Themed Birthday Parties-Children and parents enjoy play dance and music with our staff-you have fun and we'll clean up. The Eastchester Instructional Basketball League is an instructional league that “emphasizes learning and fun.” The league is for boys and girls in grades 4-8. Ballet Muscle offer personal training and fitness classes. Owner Peter Cirolia brings to the health- fitness profession, experience and enthusiasm rarely seen in a fitness professional and ballet master. Peter’s experience as a ballet dancer alongside the famed New York City Ballet helped develop an appreciation and intimate understanding of body mechanics, nutrition and peak achievement techniques which set him apart from his competitors as a fitness training pro. Through his consulting, teaching and unique individual instruction, Peter Cirolia has helped individuals from all walks of life ranging from beginner to elite athlete achieve their individual health, nutritional and wellness goals. Personal training sessions can be conducted in the privacy of your home or at Peter's private training studio. I Train With Juan offers personal fitness training, zumba and group fitness classes. Our mission is to equip our fitness training clients with exciting exercise classes and workouts that exceed their own goals! Whether you want to lose weight and body fat, or you’ve found you’re starting to plateau in your own workout regimen, you’ll want to join us today. SmartMoves Pilates offers private sessions and duets in the pilates equipment. Improve your posture, strengthen your core and stretch. Experience the benefits of this wonderful technique! Certified instructors. Parking available in front of the building. By appointment only. The Eastchester Blue Devils Football is an organized youth football and cheerleader program for boys and girls ages 6 to 14. The season is from August through November. Lake Isle is an Eastchester Town-owned facility that is open to all residents and a limited number of non residents. Town residents are defined as those people whose “permanent and primary domicile is located within Eastchester, Bronxville, or Tuckahoe. “ Along with five swimming pools and eight Har-Tru tennis courts, they have a par 70, 18-hole championship golf course. Fees for non-residents are higher than for residents. Sprain Lake Golf Course was also designed by Tom Winton. It is characterized by “small greens, rolling terrain and a number of highly challenging holes, with an abundance of water hazards and difficult shots.” All 18 tees have been renovated and expanded and the 10th and 13th greens have been upgraded. It is a public course. Siwanoy is a private country club in Bronxville that offers swimming, tennis, paddle tennis, dining and golf. Sage Hill Farm is a full-service boarding and training facility specializing in hunters, equitation and ponies. We offer expert training for horses and riders, attentive horse care and uncrowded riding rings. We emphasize safety and enjoyment in a pleasant, supportive environment where everyone is encouraged to progress toward their riding goals. Sage Hill Farm welcomes riders of all ages and abilities. Our adults, juniors and young riders successfully compete on the A and AA-rated show circuit as well as at local rated one-day shows. Sage Hill also offers a lesson program on experienced, willing and safe school horses and ponies. Situated on 30 beautiful acres in Yorktown Heights, the farm is easily accessible to Bronxville. For more information, please contact Stephanie Demmon at 203-981-9781. The Westchester Skating Academy was built in 1996 and has become “the premiere skating facility in the Westchester County area.” It offers all levels of instruction and competition in skating and the sport of ice hockey including youth and adult leagues and instruction. The Bronxville Youth Lacrosse Association (BYLA) is a parent-run and coached lacrosse league. Most programs are open enrollment and no experience is necessary. However, some travel teams may limit roster size based on tryouts. 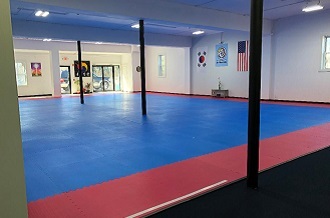 Hong Ik Martial Arts, founded over 20 years ago by 7th Degree Black Belt Grand Master Yoo, is renowned for its commitment to authentic traditional martial arts, with an emphasis in Taekwondo, Hapkido, Judo and TaiChi-Kigong. HIMA encourages each student to be their best physically, mentally and spiritually. By promoting growth through harmony and balance, we guide our students to become positive role models and to contribute to the community. HIMA has five locations including a brand new school in the heart of Bronxville. Grand Master Yoo and Master Seungmin Oh (5th Degree Black Belt) welcome you and your family to come visit and share your energy. World Cup Karate Champion, Sensei Vladimir Zolottev, is proud to provide you and your family with the highest caliber, quality, Competition Level Instruction in Shotokan Karate, Tae Kwon Do, Krav Maga, Kick Boxing, KI Conditioning, Self Defense & Fitness Conditioning! Specialized Kick Boxing, Fitness Conditioning, Cage Fitness and Self Defense classes are designed to motivate, energize and keep you in the best physical condition! The Village of Bronxville has four lighted Reilly paddle tennis courts which are available to residents and non-residents for a nominal permit fee for the season. Permits and all information pertaining to paddle can be found at www.bronxvillepaddle.com or by visiting Bronxville Village Hall. The Eastchester Youth Soccer League is a soccer program for “town residents in Kindergarten through 9th grade.” The league is held at various town and school fields in the fall and spring. KI Martial Arts - Westchester Krav Maga - - Offers Kick Boxing, Fitness Conditioning & Self Defense Conditioning! Designed for each individual, our professional instructors gear the classes to you and your physical conditioning needs. You will be challenged! You will enjoy yourself! All are welcome! Novices and advanced athletes! KI Martial Arts - Westchester Krav Maga helps you achieve your goals! All classes are specialized to motivate and inspire each of KI's students. *Children's classes are available for Children ages 3 and up. *Teen and Adult classes are geared to enhance the mind, body and spirit. *Family classes are a wonderful bonding experience. *Ladies Only classes provide intensive training in a private setting. *Special Needs Classes are dedicated to the individualized needs of the student. Please come in and visit KI Martial Arts - Westchester Krav Maga's, state of the art, self-defense, training and fitness center. KI Martial Arts - Westchester Krav Maga also offers Private Training & Fun-Filled Birthday Parties! Ask about KI's Current Promotions and Special Pricing! Please come in for a Free Class! Right now they have a $99 Special! 6 Weeks for $99! A FREE Uniform and a FREE T-Shirt are Included! After 250,000 Athletes, 5,000 College Scholarships, 1,000 Teams Trained, 150 NFL Players, and 15 First Rounders, including NHL, NBA, WNBA, and MLB Professional Athletes...they know THE PROGRAM WORKS! The NATIONALLY RENOWNED speed and performance training program has come to Westchester! From athletes 7 years old all the way to the Pros, Parisi Speed School EMPOWERS athletes to improve their athletic performance by focusing on SPEED, strength, flexibility, endurance, agility, and SELF-CONFIDENCE. If you or your team is looking to get faster, stronger, and DOMINATE any sport, Parisi Speed School will get you there! Aqua Tots believes that "learning to swim is a life skill that every child should know." It is their goal "for all children, as young as possible to be safe and competent in and around the water." They want to instill "a love to swimming to all of [their] students while teaching them to respect the water." Badger Swim Club is the only USA Swimming Level IV Club in Westchester County. There are only 33 such clubs in the country. The USA Swimming Club Recognition Program is a voluntary program that identifies and recognizes USA Swimming clubs for their commitment to excellence in operation, performance, and the support and development of USA Swimming. The Rye YMCA is a "family-oriented community service organization, which welcomes all people and promotes positive values through programs that build spirit, mind and body." They offer Aquatics for all ages, including Adult Swim Instruction and a Masters Swimming Program. Sarah Lawrence College offers community swim and fitness classes for children and adults. Available classes listed online at www.GoGryphons.com/rec . Further questions 2-mail recreation@sarahlawrence.edu. Westchester & Fairfield Swimming & Lifeguarding is a proud provider of American Red Cross Programs including Swim Camp, Lifeguard Training, CPR/AED and WSI (Water Safety Instructor). Swim Camp focuses on individual swim development and water safety for all levels and ages. Campers are instructed in small groups of similar age, skill and experience. Our staff includes seasoned American Red Cross Water Safety Instructors and Lifeguards selected not only for their expertise in teaching aquatic skills, but also their ability to provide exceptional role models for our campers. For the accomplished swimmer, WFSL makes a commitment to provide more than just job skills in the aquatics field, but to provide skills that could potentially save a life through Lifeguard Training, CPR/AED and WSI. With a commitment to "safety first, safety always!" WFSL trains students to be proficient in skill, prepared for emergency and professional in caliber." The White Plains YWCA offers swim classes to children of all ages. This includes Wee Splash for 6 to 18 months, Wee Splash Too for 18+ months and Wee Fish for children ages 3 to 5. There are also more class options. Badget Swim Club is the only USA Swimming Level IV Club in Westchester County. There are only 33 such clubs in the country. The USA Swimming Club Recognition Program is a voluntary program that identifies and recognizes USA Swimming clubs for their commitment to excellence in operation, performance, and the support and development of USA Swimming. The Gael Aquatic Club is “a competitive age group swim club located at Iona College in New Rochelle, New York” It was formed in 1984 and its swimmers have been “state finalists, Eastern United States Swimming Zone All Star selections, All County high school swimmers and many USS meet event winners.” They offer programs for children age 6 and up. Established in 1926, the Bronxville Field Club is a private club with first class facilities for tennis, squash and paddle tennis and swimming. It offers a strong junior squash program. Westchester Squash in Mamaroneck, which has four international courts, has squash programs for all playing levels from the recreational player to the nationally ranked junior. The club also hosts the Westchester Open and the Westchester Junior Open. It also offers a variety of membership options. Located in Bronxville, the College Racquet Club offers tennis programs for children and juniors age 5 to 15 as well as clinics for women. It is both an indoor and outdoor facility. They teach all different levels from beginner to tournament level players. The Director of Tennis, Neil Tarangioli, is Head Coach of the Concordia College tennis team and has been recognized for many years as an outstanding player and coach, including being named Coach of the Year by the Intercollegiate Tennis Association in 1999-2000. Lake Isle is an Eastchester Town-owned facility that is open to all residents and a limited number of non residents. Town residents are defined as those people whose “permanent and primary domicile is located within Eastchester, Bronxville, or Tuckahoe. “ Along with five swimming pools and an 18-hole golf course, they have eight Har-Tru tennis courts. Fees for non-residents are higher than for residents. Bronxville has public tennis courts located in the heart of town. They offer private and group lessons for adults and children.